I organised an event with the STEMNET (Science, Technology, Engineering & Maths Network) team at the Museum of Science and Industry (MOSI), based on the Manchester Raspberry Jam I run monthly at Madlab. The STEM Raspberry Jam was to be a new activity the STEM Ambassador network could offer to schools, so we ran a pilot (pi-lot) to give the idea a whirl. MOSI supported the event and kindly offered to host it at their fantastic venue in the museum on Liverpool Road off Deansgate in Manchester, and the STEM team had invested in ten Raspberry Pi kits (Pi, SD card, VGA converter, power cable & PiFace) which they intend to loan out to ambassadors running Raspberry Pi activities! We invited a number of schools to the Jam, and awaited their response. I was given the ten SD cards and asked to add the software we’d need to them. I imagined this would take forever but it was actually rather rapid – I initially wrote the standard Raspbian image with PiFace pre-installed to the first card using dd, booted it up on my Pi, set the raspi-config settings to enable ssh, boot to desktop, correct timezone, etc. I then updated apt and installed a few essential packages and python modules. I then ran the dd command in reverse (switching input file to the SD card, and output file to a new file on my machine: stem.img) – this copied the image from the SD card to my computer, in the state I had left it. I was then able to run the dd command again, this time writing stem.img to the blank card. I tested each one by simply booting it to desktop, with no problems whatsoever! We set a schedule for the day which included introductions, a morning session playing with Scratch and the PiFace, followed by an afternoon in Python. We had some Scratch and PiFace activities prepared, complete with booklets and instructional step-by-step guides. I’d written some Python activities for the kids to work through in the afternoon. With more time I’d have written these as part of the image I wrote to the cards but I wanted to make sure the cards worked ASAP, so I had to add the files on the day. Luckily this wasn’t difficult either – I just inserted the card in my laptop, one by one, and copied the files to the user’s home directory when it came up as an inserted drive, like a USB stick would! Six schools responded saying they would attend, bringing six pupils each. On the day, we started with a welcoming word from Donna, the STEM Development Manager, (in her best teacher’s voice!) followed by an intro talk from me (in my normal voice). 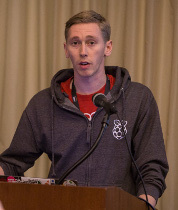 I explained what the Raspberry Pi is, what happens at a Raspberry Jam and why it’s all important (“Raspberry Why?“). 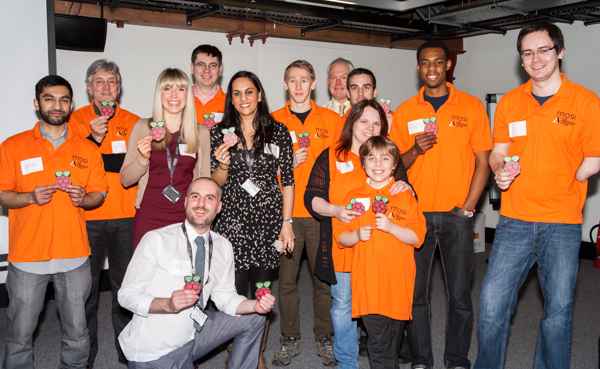 I showed some pictures of the Manchester Raspberry Jam, and other Jams around the world. I explained what Scratch and Python are, and talked about the general perspective of “geeks” and compared this to real world geeks – now popular figures such as Mark Zuckerberg! I talked about singer will.i.am donating £500,000 to improve STEM education in the UK, and how he’s now learning to code! Then we kicked off with some Scratch and PiFace – we handed out the booklets and let the groups choose an activity based on their interests and abilities. With a group of STEM ambassadors on hand, as well as their teachers, there was plenty of guidance available so they weren’t left stuck for what to do. It was great to see the kids building things in Scratch – some following examples by the letter, others just experimenting and exploring! I’ve not really used Scratch myself, but I am amazed to see it in use – some really cool things happening on screens everywhere you look – animations, controlled characters, games, interaction with real world hardware – really awesome how they just got on with it. We stopped for lunch and I chatted with some of the kids and teachers about what they were doing in school – mostly just dull ICT stuff with Word and PowerPoint, a bit of Scratch and (eugh…) Dreamweaver. However some of them seemed more excited about Code Club being run after school – so that’s something! For the afternoon session we moved on to the Python activities I’d written late the previous night! To start, I gave them intro.py – a single Python file containing a linear set of tasks, each explained in comments in the code. It was just an idea I’d had the night before, as an easy way for me to make sure they covered all the fundamentals to move on to tackling some interesting problems. This activity went down really well and lasted the whole afternoon session! All twelve groups (three kids per Pi) attempted to work their way through it – with ambassadors on hand to help out with syntax errors and general clarification, it went rather smoothly and as I wandered around the room I saw amazing progress! The script covered printing, variable assignment, basic data types, lists, if statements, loops and so on. You could see them working through the challenges and understanding the concepts. I uploaded the files to the MadlabU18 Github account, and it immediately had a couple of contributions from my partners from Coder Dojo! I’ve since been considering options for the project’s future. This week I ran a session at the Python North West User Group, where we each paired up and attempted to build a more sophisticated automated learning tool (similar to the Python Koans, but for kids). From that session I’ve had a few more ideas about how it can work. Well, watch this space. 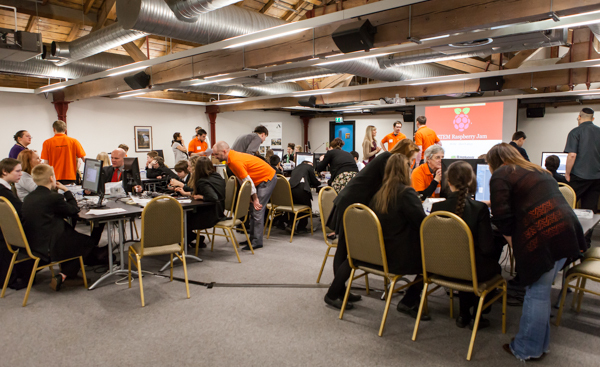 Huge thanks to MOSI, STEMNET, Donna, Dan, and all the ambassadors who volunteered their time and effort to make this happen – Arran Gallagher, Graham Nelmes, Etinosa Ogiesoba, Amin Hoque, Joe Haig, Erinma Ochu, James Burnstone, Lisa Mather and Dan Mather. Last month I attended the Manchester Girl Geeks Barcamp – affectionately known as bracamp. I did a talk on Free Software Culture, covering the varying definitions of “free” (libre/gratis), the principles of free and open source, why people do it, how development is managed and demonstrated use cases, as well as battle some gripes from a misunderstood audience member – which really helped me get my point across better. I started the talk quite poorly but got more steady as it got going. It’s not filmed from the best angle (limited options) and there’s some background noise at times but it’s generally ok.